1804: born in Edo. His father Hamazaki Chôkichi is a dekata at the shibai jaya Izumiya, located in the Ichimuraza. His mother is the daughter of a farmer living in the district of Kameido. His first stage name is Sawamura Seishi I. 1814: he becomes disciple of Ichikawa Danjûrô VII and changes his name to Ichikawa Seishi. 5th lunar month of 1815: Ichikawa Seishi takes the name of Ichikawa Udanji at the Kawarasakiza. 11th lunar month of 1822: Ichikawa Udanji takes the name of Ichikawa Seijûrô at the Ichimuraza. 1825: Seijûrô goes on tour in Kamigata and in the western provinces. 6th lunar month of 1834: Seijûrô goes back to Edo to perform at the Moritaza. 1st lunar month of 1846: Seijûrô goes to Ôsaka. 1st lunar month of 1851: Seijûrô goes back to Edo; he becomes a disciple of his elder brother Sawamura Chôjûrô V and takes the name of Sawamura Gennosuke III at the Nakamuraza, performing in the new year drama "Konoshita Soga Megumi no Masagoji". 8th lunar month of 1851: premiere at the Nakamuraza of Segawa Jokô III's drama "Higashiyama Sakura Sôshi" (commonly called "Sakura Giminden"); Gennosuke plays the role of Hosokawa Katsumoto [casting]. End of the 1850s (1858? ): Gennosuke goes to Kamigata. 1st lunar month of 1862: Gennosuke's rank in the Kamigata hyôbanki, tachiyaku section, is jô-jô-kichi (superior - superior - excellent). 3rd lunar month of 1863: Gennosuke plays at the Chikugo no Shibai the roles of Kô no Moronô and Ôboshi Yuranosuke in the drama "Kanadehon Chûshingura". 15th day of the 9th lunar month of 1863: Gennosuke dies. 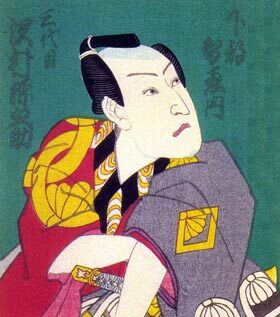 Sawamura Gennosuke III was a good 19th century tachiyaku actor, who was also able to perform female roles if needed and excelled in wajitsu. He was born and trained in Edo but achieved fame in Kamigata.